I decided that after cogitating on this project for 2 years, I'd better commit to an actual build in 2018. What better way to commit than to invest $170+ at McMaster in the various pieces needed to put together the parts I need to machine. 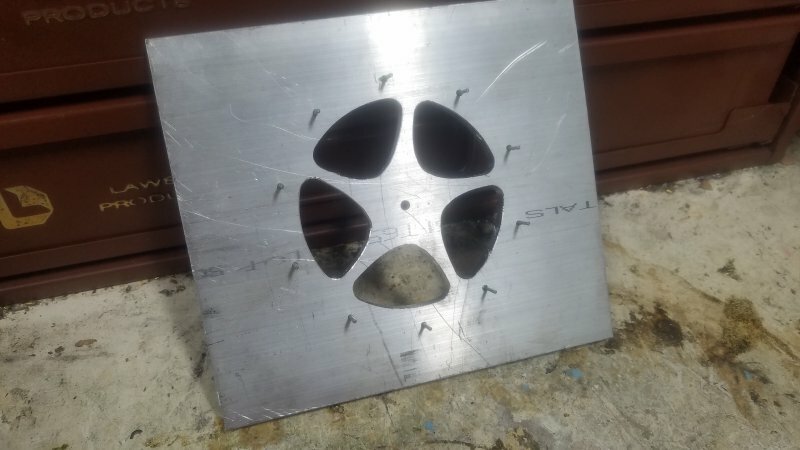 Rather than plywood this build will be aluminum for structural parts primarily, with some acrylic a possibility for some parts. The aluminum parts in many cases won't be as thick as the wooden prototype, but to maintain the overall width of the model spacers will be needed to align them. I plan to modify the Solidworks model I did using the original dimensions in order to verify fits. You are going to enjoy making your Colibri come to life. As you know, I built my version entirely out of tinted acrylic sheet (perspex, plexiglass) at a reduced size of 40%. You do not need any fancy gear cutters to produce the core mechanism. 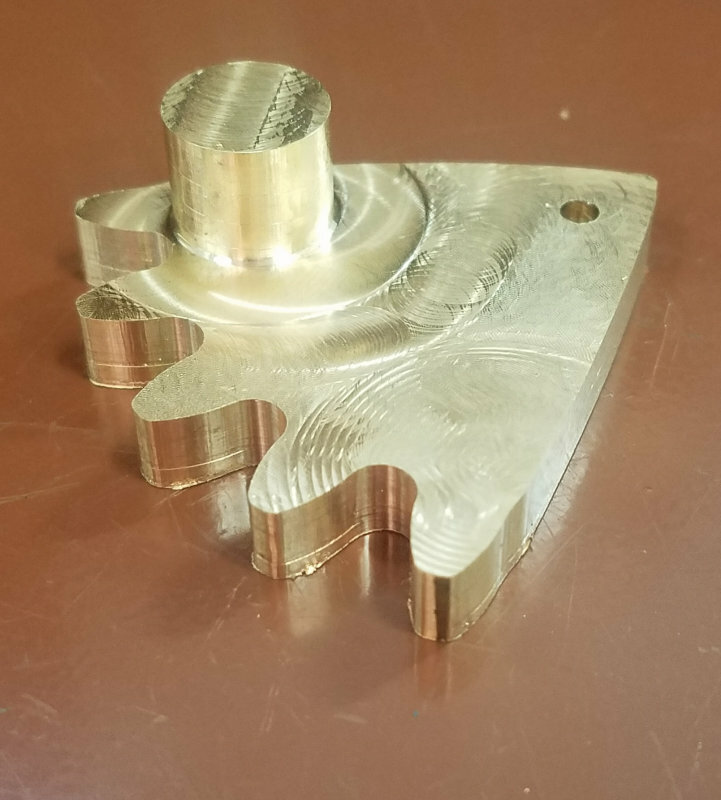 I used a 3mm end mill to profile all the gears. Derek Hugger makes generous allowances in his design to fret saw them from wood. 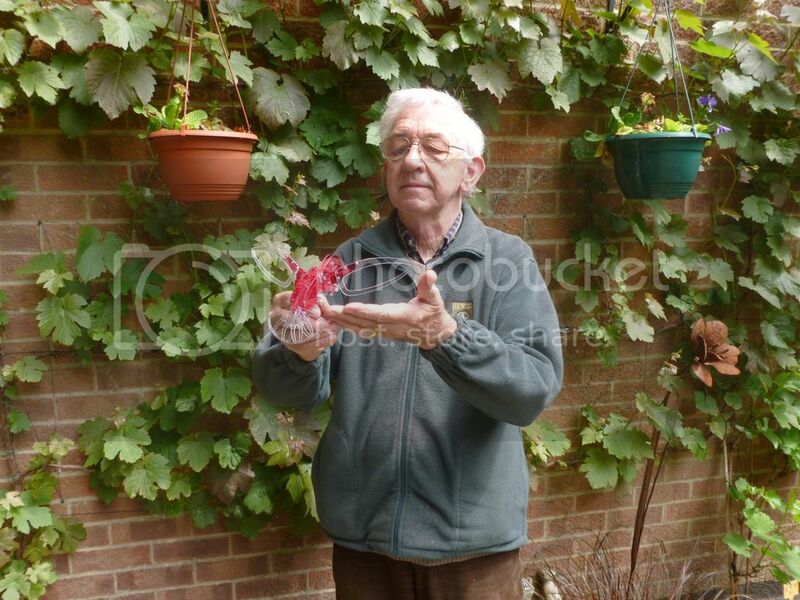 They are a rattling good fit and everything moves freely with very little fetling required. The bird is similarly straightforward to make, there are many, many pieces. The four link mechanism to articulate the wings needs plenty of attention to reduce binding and friction so that the wings beat smoothly. A bigger and heavier bird (mine is only 40% size) will help considerably. Considering materials, one issue I foresee is with the hypocycloidal gears are in contact with the frame across their entire surface. They have a mean diameter of 4.3". They can't be made of aluminum as galling could occur against the aluminum frame. I originally drew them as brass in SW, but stock for making 3 of these would be well over $120. I considered PTFE and Delrin, but here the material would be about $45 each. Since these parts are quite hidden by the cams I decided to have one printed in a hard nylon by Shapeways for $25. I'll see how the friction is before deciding whether to order two more. 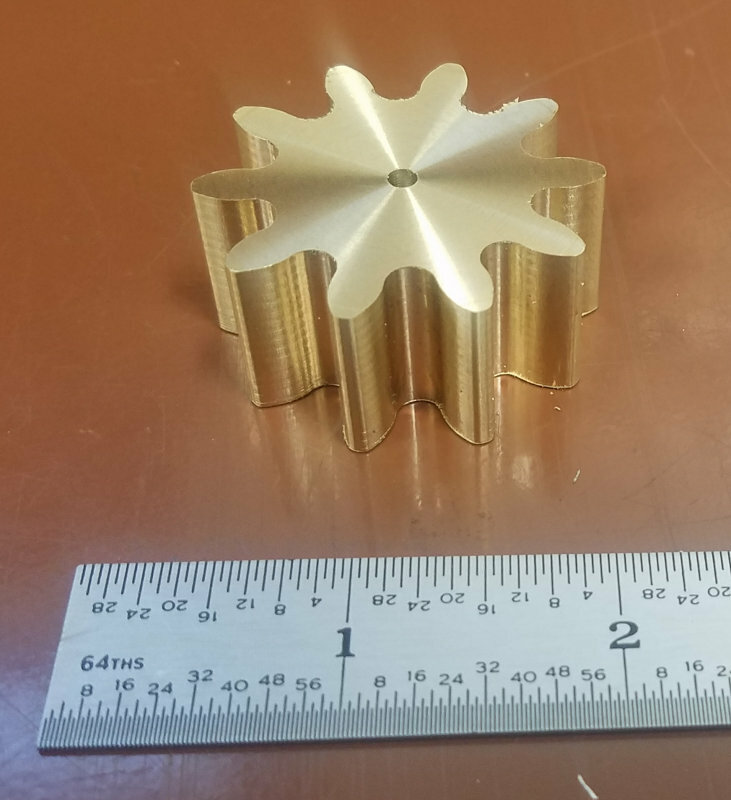 I would like the gears to be brass, but again finding 6" round pieces 1/4" thick is problematic. Again galling would be a problem with all aluminum. My idea is for the center large gear to have an aluminum body with brass gear teeth attached, made in two pieces. The other two large gears will be aluminum, and the two smaller pinion gears brass. How about grey PVC sheet, is that any better on price? I had gotten some 1/2" and 3/4" thick offcuts, machines quite well and the surface is quite smooth. That would be the cheapest material yet. Worth a look see. How about aluminum with an anodized coating? Made a test setup for a gear/hypocycloid/cam from some 1/4" 6061 and some 1/16" SS dowel pins. I should get the hypocycloid gear from Shapeways early next week and can see how the friction is between the parts. I don't foresee any problems, but I don't want to start on the frame components before checking. First part completed today. Actually it's two parts, since the wooden version has two glued together since it doesn't use any 3/4" thick stock. In any case I give you the tail pinion gear. The gear has a diameter a bit less than 1.7". 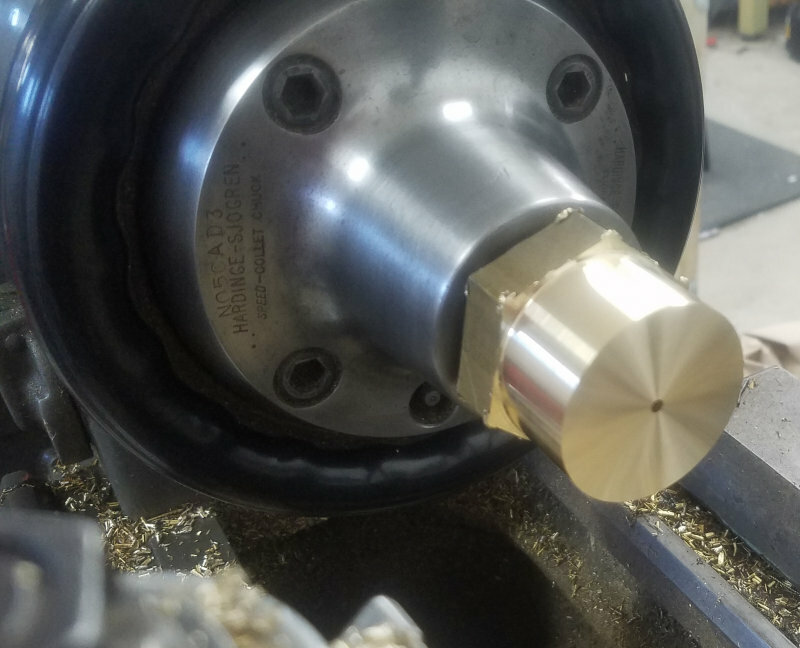 I have several lengths of brass hex rod that's 1.875" across the sides, so I cut off a 2" piece, chucked in the lathe, and turned down a 1.125" spigot 1/4" deep. This will allow the piece to be held in a 5C collet for further ops. 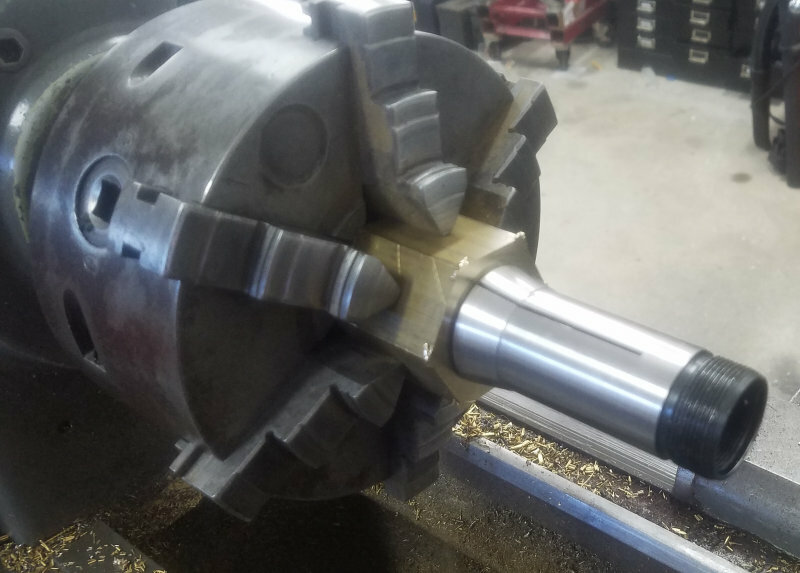 Next mount in the collet chuck and turn down to 1.75" diameter for a length of 1". The pinion will rotate on a 1/8" axis, so a hole of that diameter is drilled. 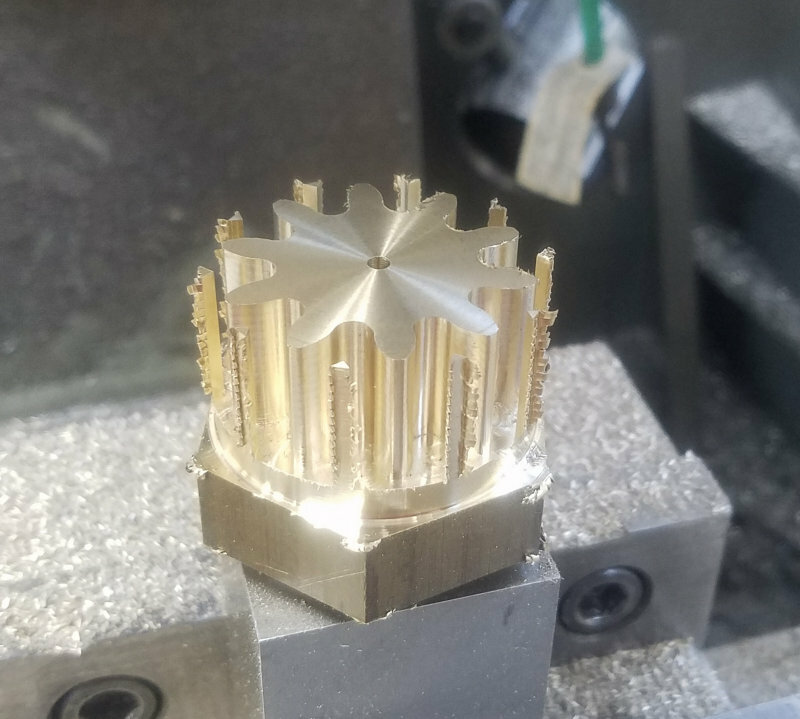 I moved the work and collet to a collet block and the vise on the CNC mill. The teeth were milled with 3/16" carbide endmill, the largest that would work. Then back to the lathe to be parted off. That is a fine looking part Kirk. I am anxious to see how the 3D printed part comes out now. Couple of more parts today, again part of the tail assembly.The "fan" is actually two parts as I machined the standoff integral to it. And then the rack. Both it and the fan are actuated by the pinion gear from yesterday. Kirk, are you using the dxf files provided with the plans?